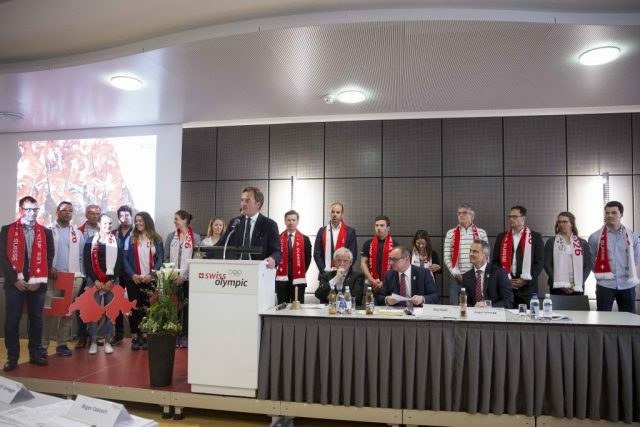 While business and political leaders in Utah and Colorado try and figure out if they should put together a bid for the 2026 Winter Olympics, the backers of Switzerland’s 2026 Winter Olympics bid are trying to sway people that it would be a good idea to hold the 2026 Games in Sion, Switzerland. You would think that holding a Winter Olympics in Switzerland would be an easy task, it is a country with winter sports including skiing and hockey and the home of the International Olympic Committee. But it has been rough sledding for Switzerland in the past and also this year in getting people to want to spend money on a two-week sports event. People in St. Moritz didn’t want the IOC’s winter sports party. On February 12, voters in the Canton of Graubünden overwhelming said no to proceed with a bid for the 2026 Games. It is quite possible that voters in the Sion area could decide the fate of that bid in 2018. Graubünden voters four years ago said no to a 2022 Davos bid. Sweden could make a pitch for the 2026 Games along with Canada as there are a number of people in Calgary who may want to put together a bid. But a municipal group looking into the viability of a Calgary Olympics has suggested it might not be wise to go after the event. The Canadian government could be spending money as part of the three-nation bid, the United States, Canada and Mexico on the 2026 soccer World Cup. Morocco is also bidding for the 2026 event. There could be other bidders for 2026 Winter Olympics, Norway, Milan, Italy, might make a proposal. What is far more interesting is that nearly a dozen plans were formulated to host the 2026 from groups in European and North America. None of them made it beyond the “we might be interested stage”.